Gavin Kuykendall's life has been shaped by his fight against heart disease. Now almost 12, he recently expressed all he's been through—by writing a letter to his heart disease. "You made my parents very sad," he said, reading his letter in a video. "You tried to make my birthday an overwhelming and unhappy day. Even though you made me incredibly sick, I was brave, I was strong." Like all first-time parents-to-be, Faith and Adam Kuykendall were looking forward to their 20-week ultrasound and the chance to take another peek at their unborn child. "Everything was going great until the doctor got to the heart," Faith said. "You could just see his face drop and he said, 'Oh no.' "
Tests showed their son had a rare condition in which the left ventricle doesn't develop properly. It's called hypoplastic left heart syndrome (HLHS). The left ventricle is responsible for pumping freshly oxygenated blood out to the rest of the body. Without immediate intervention, HLHS is fatal, usually within days or weeks. Such specialized care wasn't available in their hometown of Tulsa. Their frequent medical appointments and the delivery would need to be in Oklahoma City, nearly two hours away. Gavin arrived after 28 hours of labor. Although Faith and Adam had been warned they could see a child "blue and limp or not breathing," he came out screaming—a great sign. 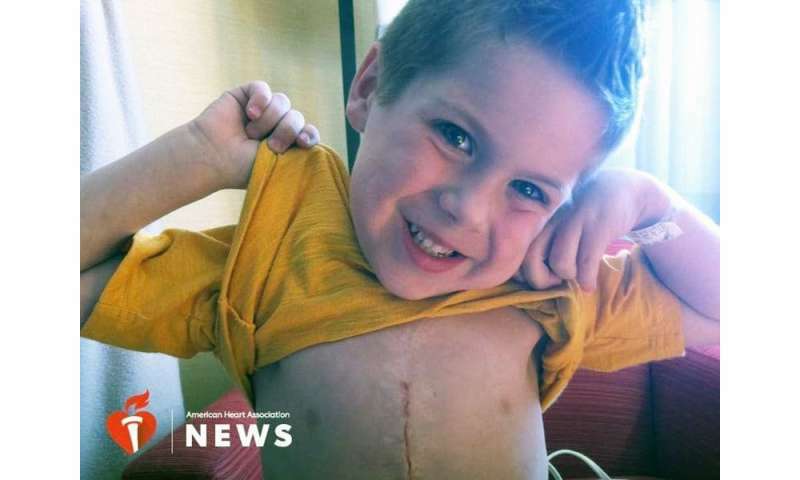 Four days later, Gavin underwent open-heart surgery to create a way for the right ventricle to pump blood to both the lungs and the body. Doctors implanted a shunt that directs blood to the lungs. Doctors left the incision open for a few days until the swelling subsided. "That was the worst," Faith said. "He was naked and swollen. You could literally see his heart beating in his chest." Gavin remained in the hospital for a month. Four months later, it was time for a second procedure. Typically, this one is easier on the child. But Gavin "wasn't eating, his left side wasn't functioning, and he was shaking," Faith said. Doctors discovered that not only had Gavin suffered a stroke during surgery, he'd become addicted to the powerful narcotics he'd been given. He was going through withdrawal, for which he was treated with methadone. Those first few years were tough for the Kuykendalls. Family, their church community and others in their support system helped them persevere, providing meals and ensuring that someone was always with Gavin. "We even had a family CPR class so everyone would know what to do, just in case," Faith said. Their network came through again in 2009, when it was time for a third surgery. The surgeon who'd cared for Gavin had left Oklahoma for San Diego, leaving their home state without anyone capable of performing the operation. Friends and family helped raise the needed funds to travel to San Diego to stay with the same doctor. And all went well. At 2 1/2, Gavin's heart was rebuilt to the best of expectations. A few months later, Gavin became a big brother. Brody was born, thankfully with a well-formed heart. "That kid is a walking comedian," Faith said. "I think God knew we needed that." Gavin was 5 1/2 when he began facing more complications. Doctors determined he needed a pacemaker to help his heart beat in a regular rhythm. The family again returned to San Diego for the surgery. Around the same time, a close friend of the Kuykendalls—Brandon Weeden—was selected in the first round of the National Football League draft. Brandon's wife, Melanie, and Adam had worked together just out of college, and the couples had become close friends. The Weedens were disappointed to learn that the state of Oklahoma lacked the specialists to operate on Gavin and other children. So after signing his NFL contract, Weeden started a foundation, which in turn helped establish a cardiac surgery research program at The Children's Hospital in Oklahoma City. "I have so much respect for Gavin and the whole family," said Weeden, who now plays for the Houston Texans. "He's already been through more in his lifetime than I'll ever go through. We have birthdays a day apart and try to celebrate together. I just think the world of him." Gavin is now in sixth grade and plays right field on his baseball team. Although he also loves football, he's not allowed to play contact sports. "Of course he wants to do what all the other boys are doing, and that's a struggle," Faith said. "Although he has some anxieties, and some physical and intellectual limitations, I don't want him to think that heart disease defines him. Luckily, he is the most determined, strong-willed child." Gavin said he's particularly proud of inspiring Weeden's foundation to help other children in Oklahoma. "I want people to know that no matter what you have, or what you feel like, you're not alone," Gavin said. "You can do this."